Yup. More hot dogs. And I think at this point working my way through the Sterns’ Eat Before You Die list, I’m not quite halfway through all the hot dogs on the list! At least they are cheap and easy. Imagine if they had such an affinity for fois gras or Peking Duck or chocolate soufflés? So I guess I’ll stop complaining about all the dang hot dogs I’m eating for this list. And it helps that I actually like hot dogs too, even if they are disgusting. Hey, I grew up in the Scrapple belt so this is a step up. Blackie’s is right off of I-84 and even if there are a lot of cars in the lot, don’t fret. All they serve here are hot dogs so the wait is never even noticeable. 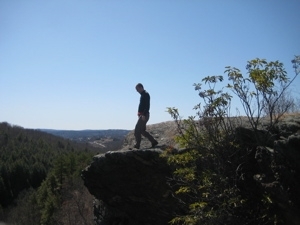 I stopped in on my way out to hike somewhere – nothing like a couple dogs in my belly to sustain me up and down Connecticut’s northwest hills, eh? There must be something good about the dogs… They’ve been around longer than your grandfather. Any place with such a long history must have an interesting one. The Blackie’s website has a rather extensive write-up, some of which I’ll give you here. Mary Mahoney left her home in County Kerry, Ireland in search of the American dream; she met and married Art Blackman, a Waterbury native. Together they bought a couple of acres of land on the Cheshire/Waterbury line. Their dream was to own a business and by 1925 they had opened an unassuming gas station. The Blackman’s gas station was a gathering spot for friends and neighbors; soon they were serving hungry patrons hot dogs smothered with the Blackman family’s homemade relish. During WWII, times were tough for the nation and government imposed a beef ration, Blackie’s was only allowed to sell one dog per customer. Blackie’s original building was a small narrow rectangle; the interior had a long counter with booths at the front of the building. Blackie’s business continued to grow and to accommodate customers, octagon shaped towers were built on both sides of the restaurant. The east tower had an elevated balcony around the edge where couples would gather and socialize. Something else unique about Blackie’s? They still do not serve French fries and continue to be closed on Fridays. 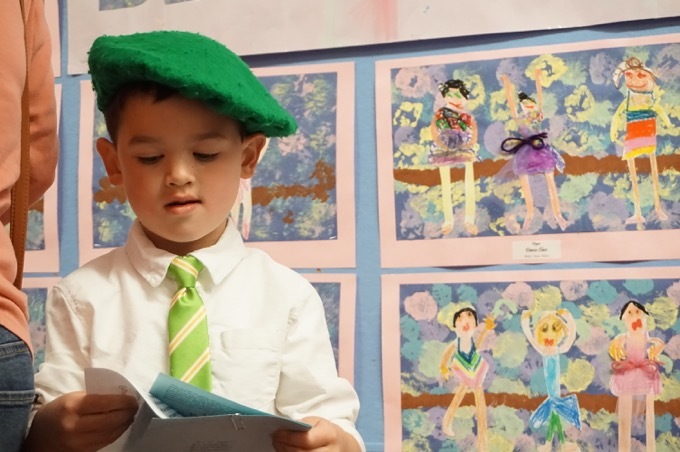 You can still enjoy a birch beer on tap and cartons of chocolate milk. The Blackman and Flavin families devoutly followed the Catholic faith and many years ago you were not allowed to eat meat on Fridays. The Catholic Church changed its policy but we have maintained the tradition. And Blackie’s has never served fries for no real reason. We are embarrassed to admit that we have lived in Connecticut half our lives, but never went to Blackie’s until just recently. It has been a thriving drive-in since 1928, and for hot dog lovers in greater Waterbury and beyond, it is a culinary landmark. Its unique twin-barn shape (a wood-paneled dining room on either side of the open-air counter) heralds picnic-style meals that taste especially right on a happy summer day. 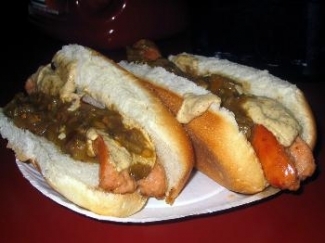 Hot dogs are indeed the specialty of the house; in fact they are nearly the entire menu. 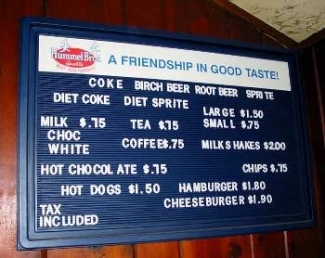 There are hamburgers, too, and they’re fine; you can get a milk shake or a soft drink; and that is the end of the short list. Blackie’s has no utensils, no reusable plates or glasses, and no dessert. It doesn’t even bother to make French fries. 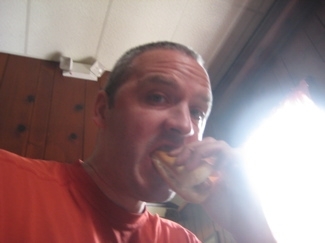 Hot dogs are all that really matter. They are big, pink Hummel-brand plumpies that are boiled to the point that they literally blossom with flavor as their outside surface bursts apart from heat. They are served plain in ordinary buns, and it is up to each customer to spoon out mustard and relish from condiment trays that are set out all along the counter. That’s the really good part about dining at Blackie’s: dressing the dogs. The mustard is excellent, and we recommend a modest bed of it applied to the top of each wiener, all the better for the relish to cling to. 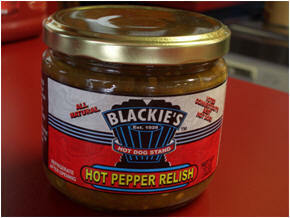 This relish is transcendent. Made from the same recipe that put Blackie’s on the map three-quarters of a century ago, it is thick, luxurious, and pepper-hot enough that your lips will glow after lunch. Blackie’s – and its customers – are so devoted to this formula for frankfurter perfection that the kitchen doesn’t even bother to offer sauerkraut or chili. Place an order at the counter and within a minute or two your hot dogs will be presented on a thick disposable plate. It is the customers’ job to carry plates and beverages, plus stacks of napkins, into one of the dining rooms. When finished with the meal, the management appreciates it when people toss their plates, napkins, and cups into the garbage cans provided. I went in, ordered two dogs, sat down, and ate them. As I said, I didn’t put any of this otherworldly relish on them but rather stuck to just their mustard, which is excellent. It is in the spicy brown mustard family, which I have been known to lick from spoons. 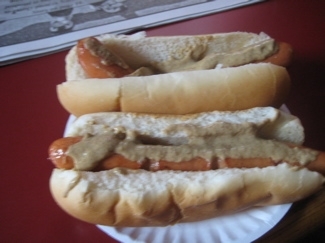 It’s funny, the dogs are just Hummel’s hot dogs on plain buns, but they ARE good. And cheap. Blackie’s has a formula and they’ve stuck to it for many years, which is why it works. I appreciated the Spartan menu and the throw away plates and stuff. In and out in 5 minutes… And sometimes, that’s just perfect. I am partial to the Home Depot dog myself. Blackies is the most hideous excuse for a hot dog stand on the face of the earth……….by far………….by a long shot….its not even close…….really…im not lying…. I hope you’ve tried the relish by now. I was a Cheshire resident for years before I went to Blackie’s and it changed my life. Before that, I didn’t even like relish. Now I have to stop by there every time I pass Cheshire on 84. Mmm I’m drooling! Grew up in Prospect, just up the hill from Blackies where in my teens and early 20’s, we frequently went on date nights. All of my family now live out of state and talk about how great Blackies hot dogs were, and how we could never find another place whose relish could come close to theirs. I found out by accident that you could purchase the relish and enlisted my best friend to go buy several jars for me. As a surprise gift that year, Santa delivered the relish to my siblings in California, Connecticut and Florida along with a copy of the Blackies logo. Turned out to be great surprise. A tasty treat from our past. If you gave not yet been there, next time you are on i84, exit at Cheshire / Waterbury line and discover this delightful spot. Just remember, they are still closed on Fridays.